Toss a stone into the still waters of a pond and watch the concentric ripples spread. That’s how to describe Wendell Berry’s impact. Through tossing words—written and spoken—into issues, his influence has carried to the far reaches of the globe. At first glance, you might mistake khakis-clad Wendell for a gentleman farmer, puttering around in his well-dented pickup truck. He is a farmer. And by all means, he is a gentleman. But you can’t stop there. He’s the first living person to be inducted into the Kentucky Writers Hall of Fame. Wendell has authored more than 40 books—novels, collections of short stories, essays and poetry. After a few letters and follow-up phone calls, Felix and I were on a 1,042-mile jaunt to visit with one of America’s most respected environmental activists. On a sun-kissed Sunday afternoon, we sat in Wendell and Tanya’s kitchen and compared notes. 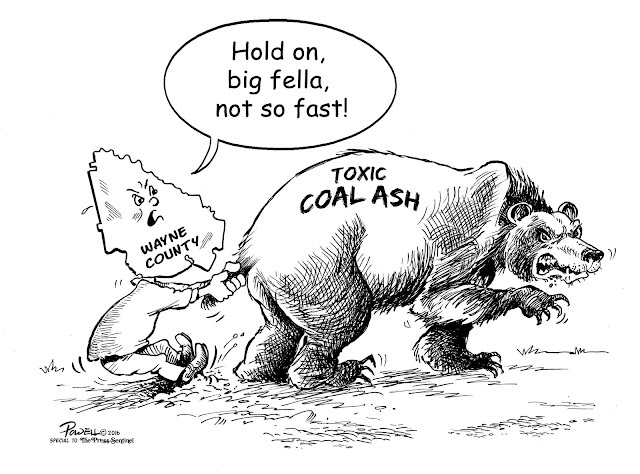 Wendell’s been a student of our challenge to stop Republic Services from stacking millions of tons of toxic coal ash in Broadhurst. 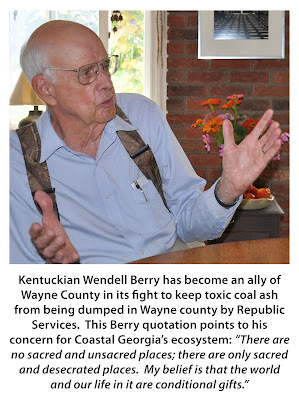 Wendell Berry is a devout, well-mannered man, but he doesn’t back down. He helped organize Kentuckians for the Commonwealth. If it takes leading protests or staging a sit-in at the governor’s office, Wendell is fearless. At one time, he gave his massive archives to his alma mater, the University of Kentucky, where he also taught—twice. But when it became obvious to him that the university was too cozy with the coal industry, Wendell took his materials back.